Celebrate your garden with the gorgeous hummingbird and flowers motif of this wooden slatted swing. Cushions are manufactured from Sunbrella material which is designed especially for outdoor use. The swing stand is not included with our outdoor wooden garden swing, but it is available. Wood is hand selected for appearance and strength. *Note on chain sets: the zinc chains will eventually rust over the years; the stainless steel chains will never rust. Specify the size and other aspects of your furniture using our drop down boxes (shown top right). This Amish wooden swing's elegant curves are meant for comfort, so we hope you don't mind us calling it plain. Cushions are manufactured from Sunbrella material which is designed especially for outdoor use. Swing stand is not included but is available. Enjoy the outdoors with the simple look and comfortable, durable feel of the 4 to 6' Rollback Personalized Pinewood Swing. Select from our 4, 5, and 6 foot wide models. Choose your personalized lettering to be displayed on the back of your chair with a plain, hummingbird, or heart design. Your lettering will be carved into the wood using a CNC router. Add our reversible cushions to your seat in reversible burgundy/green, and tan/tan. Cushions are manufactured from Sunbrella material which is designed especially for outdoor use. Also add a set of springs to give your swing a little more bounce. Swing stand is not included but is available. 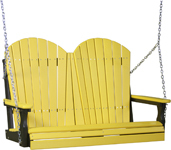 Add comfort and fun to your outdoor space with the high double back of this solid pine swing. 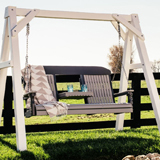 This comfy Amish vinyl swing set for two has high curves on the back, so you can lay your head back and swing. The poly lumber lets you relax instead of doing maintenance work. *The Adirondack Chair Swing is Available in White, Black, Chestnut Brown, Weatherwood, Green, Dove Gray/Slate, Dove Gray/Black, Cedar/Black, Weatherwood/Chestnut Brown, Weatherwood/Black, Cherrywood/Black, Aruba Blue/Black, Red/Black, Tangerine/Black, Yellow/Black, Lime Green/Black, Blue/Black, Antique Mahogany and Antique Mahogany/Black. - Note on chain sets: the zinc chains will eventually rust over the years; the stainless steel chains will never rust. - Ships via FedEx Ground in 2 boxes; some assembly required. These quality pieces of handcrafted furniture are made of Poly Vinylethylene. The high density Poly Vinylethylene raw material utilized in Poly Vinyl lumber is derived from post-comsumer bottle waste such as milk containers. The material is cleaned in a decontamination process to a purity level of over 99% HDPE. It is then compounded into rigid board stock material; the resutling finished product containing over 90% recycled post consumer waste by weight. Select the color, size and other aspects of your furniture using our drop down boxes (shown top right). Assembled under pressure for rigid suspension. This swing's straight lines and high back add sophistication compared to other poly vinyl swings, but it is just as easy to care for. *Available in White, Black, Chestnut Brown, Weatherwood, Green, Dove Gray/Slate, Dove Gray/Black, Cedar/Black, Weatherwood/Chestnut Brown, Weatherwood/Black, Cherrywood/Black, Antique Mahogany and Antique Mahogany/Black. This lovely swing is called plain but it exudes beauty in its slight ergonomic curves, and poly vinyl is easy to keep beautiful. These quality pieces of handcrafted furniture are made of Poly Vinylethylene. The high density Poly Vinylethylene raw material utilized in Poly Vinyl lumber is derived from post-consumer bottle waste such as milk containers. The material is cleaned in a decontamination process to a purity level of over 99% HDPE. It is then compounded into rigid board stock material; the resutling finished product containing over 90% recycled post consumer waste by weight. Use the drop down boxes shown top right to select options for your order. *Available in White, Black, Chestnut Brown, Weatherwood, Green, Dove Gray/Slate, Dove Gray/Black, Cedar/Black, Weatherwood/Chestnut Brown, Weatherwood/Black, Cherrywood/Black, Aruba Blue/Black, Red/Black, Tangerine/Black, Yellow/Black, Lime Green/Black, Blue/Black, Antique Mahogany and Antique Mahogany/Black. Step back to the gilded age with this gorgeous swing stand. White poly vinyl with its slatted design is a perfect match for your porch and picket fence. Yet it needs much less cleaning and no new paint at all! Fit any of our swings, wood or poly, into this lovely stand. The Cutout Heart Double Lawn Glider provides shade and plenty of room for swinging companionship. The styling, with curved seats, an arched top and cutout hearts, is perfectly sweet on a swing for two. Choose between the cedar or lattice roof versions. 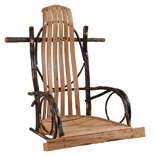 This country swing has darling curved twig arm rests, a paneled back, and a comfortable contoured seat. Swing back to the gilded age with a Victorian-style wood porch swing stand. Narrow panels and a concave roof add sweet coziness to your swing. This yard swing frame will work with any of our swings. Protect your swing from the rain and add style to your yard or garden area. A lawn swing that fits the natural backdrop of your country home is a great spot to increase your time outdoors. This A-frame swing stand has the style of logs, while the swing itself has its back mounted on a relaxing angle. Swing into country style with this rustic porch swing. On this swing a timber seat and back are framed by log sides to build a relaxing experience. Swing into summer on our comfortable slatted hickory design. Contoured slats and twigs similar to those on our rocker are just as soothing on a swing. You are at the cabin to enjoy nature and a durable, rustic swing is one more reason to be outside. Amish porch swings are a great addition to any porch, patio, or lawn and garden area. Adding an Amish outdoor swing to your home will provide you with a great way to enjoy the outdoors in a relaxed and comfortable way. By buying an Amish porch swing rather than an outdoor swing built by other manufacturers, you will feel assured knowing that what you invested in your purchase will be worth the money by buying something that will last through the many years of harsh weather and climate conditions. Amish Furniture Factory has a selection of outdoor wood swings for adults and children alike. Cheaper outdoor swings have very little built in protection against the years of constant UV ray, moisture bombardment and temperature fluctuations. Everyone has seen the weathering effects on outdoor furniture which includes warping, cracking, rotting and color fading. Our Amish porch swings are available in two different materials that greatly reduce the effects of wreathing and will significantly extend the life of your Amish swing. Our hardwood Amish swings are available in cypress, and pinewood. The cypress wood swings are all natural while being decay resistant, and insect resistant, while being resistant to the effects of outdoor use and weathering due to a naturally a occurring preservative in the wood. This preservative in the cypress swings enable the pieces to be left unfinished and untreated. Our Amish porch swings are sold with a one year warranty. Our pine wood swings are another excellent choice for your outdoor swing. Pine wood offers excellent value and a high strength to weight ratio. 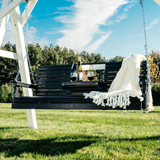 The pine wood in our pine swings has been hand selected by our skilled Amish craftsmen based on appearance and strength, have been pressure treated, and are assembled with stainless steel screws to ensure long outdoor lives. Our pine wood swings are sold with a one year warranty. If you like the look of our dyed poly wood swings, you can purchase the most durable and long lasting swings available on the market today. The poly vinyl porch swings are a recent revolution in outdoor furniture production. The material used, called Polyvinylethylene is derived from post consumer plastic bottles such as milk jugs and water bottles. The poly wood is cleaned in a decontamination process to a purity level of over 99% HDPE, before being compounded into rigid board stock material. The resulting finished poly vinyl porch swing contains over 90% recycled post consumer waste material, by weight. The board stock is worked, cut, and shaped by our Amish builders just like hardwood. Not only will you be benefiting the environment by buying a recycled poly vinyl porch swing, your swing will last for generations.